A great location in the business and hotel heart of Polanco, you couldn’t be any closer to the neighborhood’s best restaurants, cafes, and nightlife. Located in a quiet block of Campos Eliseos and on the 3rd floor, this apartment is the best hotel-alternative stay in the area. The apartment is spacious and light, with large windows offering views of the city. With a large open plan living and dining room, the generous spaces are both rare for Polanco and a great feature if you are travelling with family or company. Each of the two generous bedrooms offer king beds, hotel-quality linens, and ample closet space. For those travelling with children, or need the extra space, there is also a separate media room equipped with large flat screen TV and cable service as well as a desk for working. Wired and wireless high speed internet is available in the apartment. The kitchen is well equipped with new appliances including a dishwasher and waste disposal unit. 24-hour onsite security, elevator access to the apartment as well as free on-site private parking make this a better option than the surrounding hotels. You’re also a short walk from Chapultepec Park where you can visit the famous Anthropology museum and learn about the history of México at Chapultepec Castle. Polanco is also ideally situated for transferring to and from the airport, and along Reforma to city’s historic center. 2. At check in, you will be required to sign our renters agreement outlining our terms and conditions. A copy of this will be forwarded to you upon request. 3. For stays longer than one month, additional security deposit will be required. For stays longer than three months, the last month of rent will also be due at check in. 4. Complimentary maid service is included for reservations over 7 nights (1 maid service per week). Additional services are available upon request. 5. Smoking is strictly prohibited inside the home. Gorgeous, modern apartment with great location and host! I stayed here with three girlfriends for five nights in January. We loved the convenience to El Chapultapec park and the many museums, restaurants and shopping nearby. There is a wonderful tea bar and restaurant just around the corner, where we enjoyed many meals - one even complete with a cello performing outside! Uber rides to La Condesa and other great nearby neighborhoods were cheap and easy to grab, making the quiet, tree-lined streets of Polanco a nice quiet place to return home to. There are also fancy restaurants downstairs, although we never made it to them, given so many things to see and do! The apartment has a bright, clean decor and beds were comfy and showers hot! The only feedback would be to have more glassware - no shot glasses for tequila or mezcal - and perhaps more throw blankets for cold winter nights. We aren't accustomed to buildings without heat - the standard in Mexico - and with the large windows the apartment could be chillier than the outside air at night and in the morning. Something good to consider when packing if staying in the winter - bring slippers and sweaters - so that you can hang in the central spaces and enjoy the beautiful ambience. Check-in was super easy, with a doorman on staff 24 hours a day, which also makes you feel very safe coming and going at all hours. The host (I have forgotten his name) was very friendly, with perfect English, and helpful when we were looking for best transport or guide opportunities to go to Teotihuacan. He felt very accessible and ready to assist with any request. I loved staying here and feeling like a local, and would definitely come back to enjoy this or any other Remixo location again! Wonderful location, charming and comfortable. My friend and I enjoyed 3 nights and this property and loved it. We both had comfortable beds with nice linens and the place was charming. The location was in walking distance to so many cafes and restaurants and the park- we could walk almost everywhere. And Uber also came quickly every time we called. It’s nice that the building has a doorman and restaurant downstairs. I didn’t bro g my kids but this would also have made a great flat for a family to rent. It was lovely to stay there. The manager was very kind and helpful too. 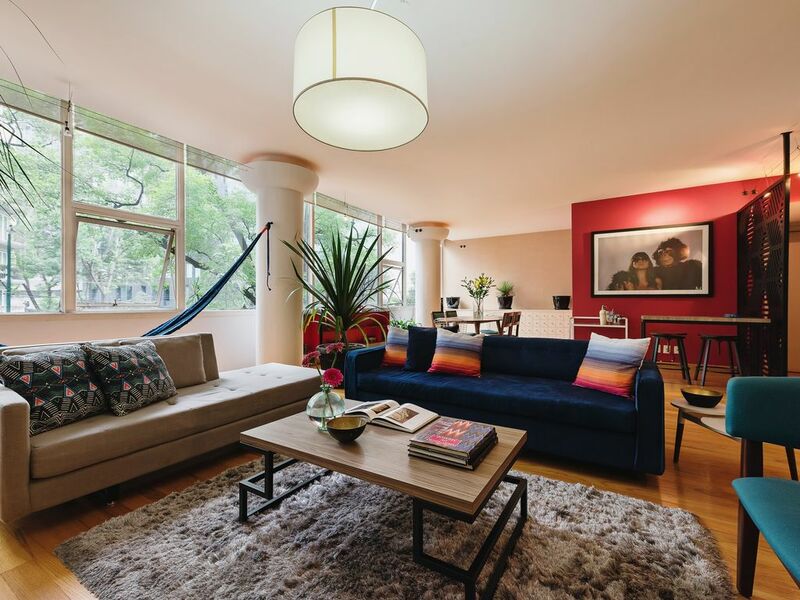 Close to everything in the amazing neighborhood of Polanco!! We had three small children with us and the apartment was perfect. The property manager was also helpful and reachable during our entire stay. Very nice place in a very nice part of town by anyone's standards. Rent and Enjoy!